At the halfway point of the year, 2017 remains the second-hottest year to date — a surprise given the demise of the El Niño that helped boost temperatures to record levels last year.The continued near-record warmth is a marker of just how much global temperatures have risen thanks to the greenhouse gases accumulating in the atmosphere from fossil fuel use. How monthly temperatures differ from the 1951-1980 average. 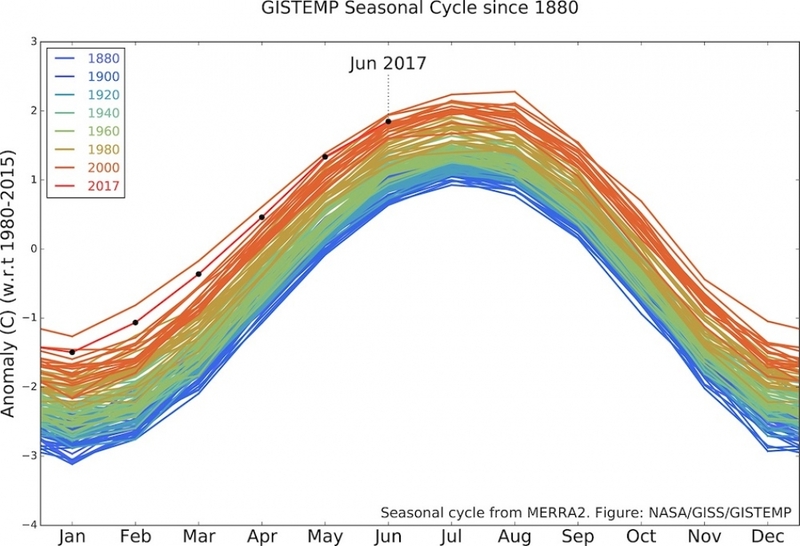 So far, 2017 ranks behind only 2016 for the temperature for the first six months of the year. The odds are good that 2017 will stay in second place through the end of the year, and it is even more likely that it will remain in at least the top three hottest years. The hotspots around the world for June included central Asia and western and central Europe. A searing heat wave in western Europe that helped fuel deadly wildfires in Portugal was made up to 10 times more likely because of Earth’s rising temperature, according to a recent study done in partnership with Climate Central. The U.S. Southwest was another stand-out, with a heat wave that pushed temperatures so high they prevented some airplanes from taking off at Phoenix’s airport. 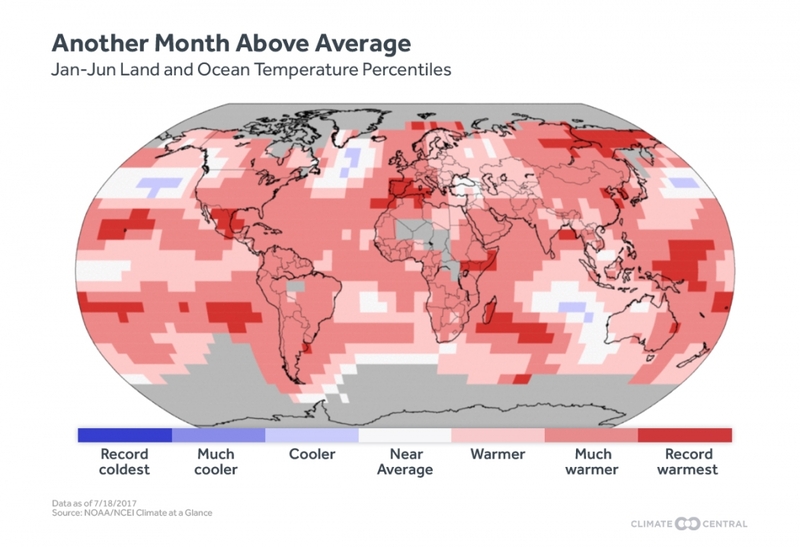 Every month of the year so far, including June, has ranked in the top three hottest for that month. Overall, the first six months of the year were 1.64°F (0.91°C) above the 20th century average of 56.3°F (13.5°C), according to NOAA. They were 0.29°F (0.16°C) behind the same period in 2016, which turned out to be hottest year on record, but ahead of 2015 by 0.09°F (0.05°C). According to NASA, the first six months were 1.64°F above the 1951-1980 average. The Paris Climate agreement, which President Trump has pledged to pull the U.S. out of, set a goal of limiting warming to under 2°C (3.6°F) above pre-industrial levels by the end of this century (and to aim for an even more ambitious 1.5°C (2.7°F)). To make the global temperatures more relevant to that measure, Climate Central re-analyzed the numbers by averaging together NASA and NOAA’s data and comparing them to the average for 1881-1910. June 2017 was 1.81°F (1.01°C) above that average, showing how little wiggle room is left to keep temperatures under that level. While there were several spots that have seen record-warm years so far — including Mexico, parts of eastern Russia and China and western Europe — the heat is fairly broadly spread around the globe. How temperatures around the world differed from the 20th century average over the first six months of 2017. Five of the six continents had a top 10 warmest January-June, with South America hitting the No. 2 spot for that period (tying with 2010 and behind only 2015, according to NOAA. Gavin Schmidt, director of NASA’s Goddard Institute for Space Studies, said that there was a 57 percent chance that 2017 would remain the second-hottest year on record through December, and even higher odds that it will end up in the top three. Sanchez-Lugo said that if the rest of the months of the year rank in the top two, 2017 will clinch the No. 2 spot; if they rank in the top three, it will fall to No. 3. Wherever its final rank ends up, 2017 will almost certainly be hot enough to knock 1998 — the only remaining 20th century year among the top 10 warmest — down another spot, to No. 9 in NOAA’s rankings. At the time, 1998’s heat was exceptional, and was fueled in part by a major El Niño, which tends to raise global temperatures. But as Earth’s temperature has steadily risen because of heat-trapping greenhouse gases, an El Niño isn’t necessary to reach those heights anymore. In fact, years with La Niñas (which tend to cool global temperatures) are today warmer than El Niño years several decades ago. 2017 actually started out with a La Niña, albeit a weak one, but it is 0.38°F (0.21°C) ahead of 1998, Sanchez-Lugo, said. If the streak of very warm years continues, “I wouldn’t be surprised if the next two to three years we would see ’98 drop out of the top 10 warmest years on record,” she said.